Of course, advances in technology have also made it easier for the pros to build awesome applications. Just look at SEOmoz's Open Site Explorer which relies on Amazon Web Services. So as SEOs we have a huge arsenal of tools that we can call upon for various different functions. A lot of these tools, services and platforms however either require learning a large amount of code or take a long time to build something bespoke. So in this post I'm going to talk about using Google Spreadsheets to build small, agile tools which can be built to match your exact needs. Before I dive into the technical details, a quick word on what I use Google Docs for. In my SEO-ninja toolset Google Docs are used for quick, agile tools. That means that if there's a specific problem I need to overcome or some weird thing I'm testing I always turn to Google Docs first. That's because I can build things quickly. They aren't always robust, but if I'm only building a tool to solve a unique problem (as opposed to a problem I encounter all the time) then speed is of the essence. I don't want to have to spend a lot of time building a tool I'm only going to use once. Or running a test that turns out to not give me the expected results. If you want to build scaleable tools then I suggest you leave it to the pros (though Appengine is a great place to start with building "real" tools). Don't get scared! There's lots of things you probably don't understand so let's walk through them for you. A standard function looks like this =importxml("url", "query"). So the URL can be explicit (like I typed above) or a reference file like this =importxml(A1, "query") just like you would with a regular spreadsheet function. The query is an XPATH query. For a tutorial reference on XPATH here's a good guide. So, now we're getting to grips with the code let's step through a practical example. A common SEO task is "how can I find as many blogs on niche X as possible". So I google around and find a list of the top 25 blogs on Technorati: http://technorati.com/blogs/top100/. It's manual and time consuming having to click on each one to copy the link. I want to get the list of URLs into a spreadsheet as quick as possible. Check out the sheet here. 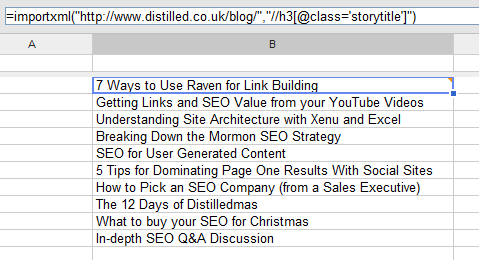 3) As you can see, it contains the blog names so we're getting there. But our query is also getting a whole load of other stuff we don't want. So let's look in the code and see if we can isolate the list of blog items. I find the "inspect element" control in Google Chrome excellent for visualising this. As you hover over the code, it highlights the section of the page that applies to it. As before, Grab your own copy here.
. Using this formula, I can extract exactly what I need from all the returned results, hopefully you can pick out what I'm doing! I should note at this stage that there is a limit for 50 importxml calls per spreadsheet which limits us from building a full web crawler but for most agile tools this is sufficient (especially when combined with scripts, see lesson 3). Now, all this is very well - we have functions which pull in data but it's all a little "flat" if you know what I mean? Let's try and jazz things up a little by making it MOVE. For anyone familiar with macros in excel, scripts function in a very similar way. Two big advantages here however are the ability to crawl URLs and also the ability to email you. Nice. Once you've read through the Google Scripts tutorials above you should be fairly comfortable with how this works so I'm not going to step through it in detail. The parsing XML tutorial will likely come in handy. Read more about script triggers here. The most useful here is the time-based trigger I think. Let's take a quick look at writing a time-based script. Note the getRange and setValue functions - these are very useful to get your head around. See this tutorial. Grab a copy of the spreadsheet here to see how it works.